Why choose to design stylish camera bags?There are a lot of things to think about when designing a camera bag. For instance: the weight, how easy it is to get in and out of the bag, how waterproof it is, deciding what camera and lens combinations the bag is designed for, etc. But very few companies think about style. Most photographers don’t choose a camera bag based on how stylish it is. And we understand that. However, we believe that a camera bag can be as stylish as it is functional. One simply needs to slightly shift their paradigm and decide how to go about designing stylish camera bags, which are functional and fashionable, instead of just ones that are functional, but leaves the user wanting more. For the past 20 years or so camera bags have been cheap, effective and highly disposable. Contrast that with camera bags made before inexpensive, overseas trade was readily available. These bags were often made of leather and looked beautiful. You can sometimes see them in antique shops, still looking great, with plenty of life left in them. What happened? Well, probably the same thing that has happened to most of the goods we buy. The consumer started demanding more, more, more… instead of less, but better quality. In effect, we have become a throwaway society. And that extends to camera bags, just as much as it does high street fashion. 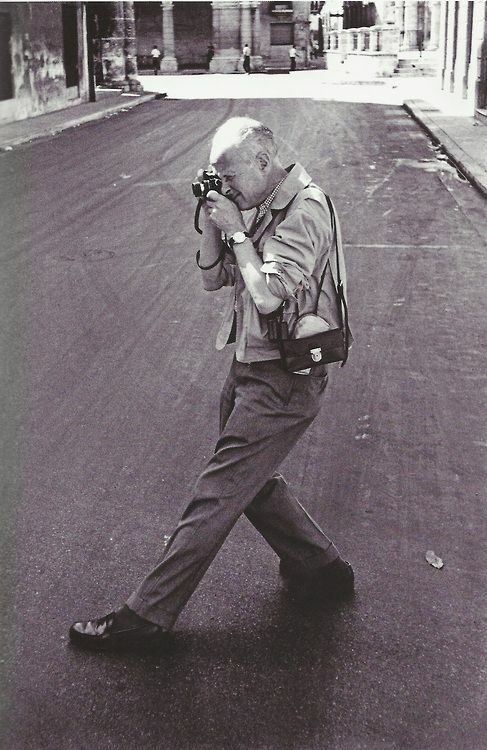 The legendary Henri Cartier-Bresson shooting with his Leica, of course, and bag. Nowadays, some people might call that a purse, or say it looks like a “man-bag”. However, we think it’s a beautiful way to carry around your photography essentials. It’s stylish and looks great around his shoulder. Besides, who says men are the only photographers on the planet? We know many women who would be very glad to see a more feminine take on camera bags, or at the very least, make them a bit more gender-neutral. How did we go about designing stylish camera bags? One of the trickiest things to get right is to blend style and function into a camera bag. And then to have other people understand why you’ve done things the way you have. For instance, when we developed our turn lock system for our camera messenger bags, we did so thinking about function first and foremost. The turn lock is one of the oldest and most useful bag opening and closing mechanisms available today. 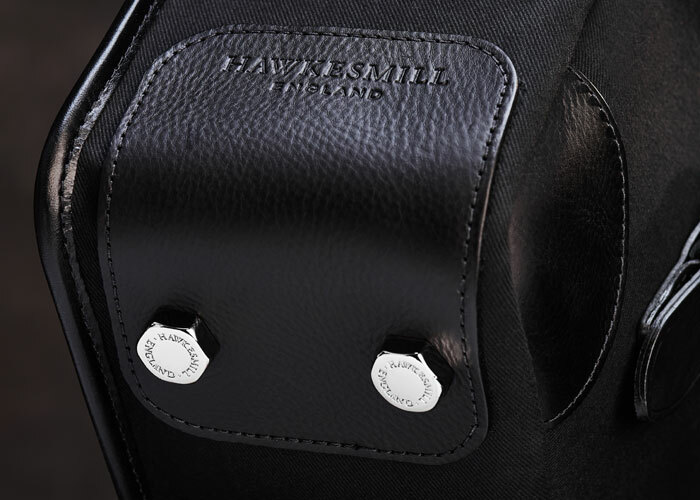 A turn lock allows the user to have a bit of security when the main leather straps are left undone, while shooting. It is harder to get into and out of the bag when the turn lock is closed. And it also protects the user from losing, or damaging their gear if the bag were to tip open. So, although a turn lock is a beautiful and stylish accent on a camera bag, it was designed to be a functional feature first and be stylish second. The same is true for our custom feet. We designed them to be 7mm deep, which would provide ample room for the feet to protect the bottom of the bag. It was made in a bolt pattern because that looked beautiful. Every other camera bag that we know of, uses round feet without any custom branding, or style. We didn’t understand why all of the main fashion brands had these types of accents, but camera bags were lagging behind. After all, a camera bag is still a bag. Trigger hooks have been used on bags for many years. However, no company had made a camera bag with a trigger hook as the main means of opening and closing the bag. Why not? They are one of the most secure systems available. That’s why it’s used on so many applications. At Hawkesmill, we don’t like to reinvent the wheel. We simply look for areas of improvement within the camera bag market. The trigger hook is an underutilized mechanism. 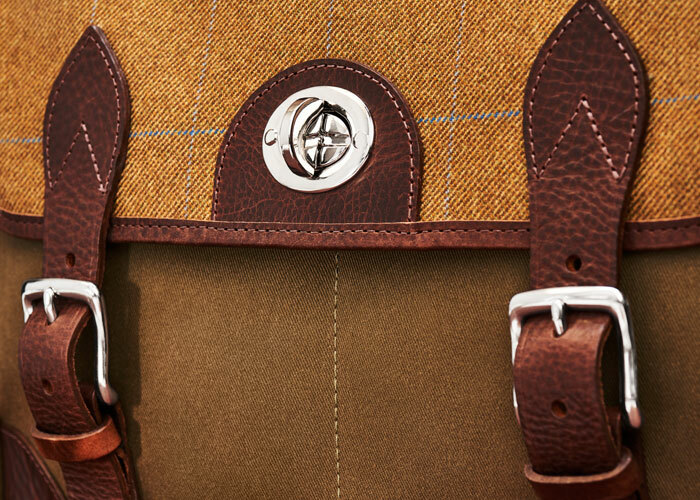 Again, many fashion brands choose to use custom, beautiful trigger hooks on their bags. Why can’t a camera bag have one? Are all photographers bland, boring people that gravitate to Nylon and have life threatening diseases that react poorly with metal? We don’t think so. It’s simply that nobody has made camera bags like this before and we have somehow gotten ourselves into a rut as photographers. Most photographers buy the same bags, using the same materials, which all basically perform the exact same way. We’re not saying that adding a simple trigger hook, or turn lock will automatically make any camera bag stylish. No. 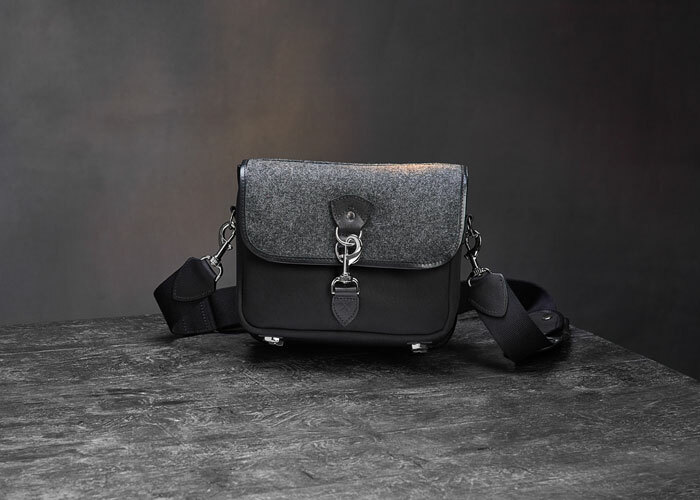 We’re simply saying that instead of making a camera bag in the same way that everyone else is, we’re designing stylish camera bags, utilizing tried and tested styles, such as: Harris Tweed in colours that are traditional and well suited to the canvas material we’re using, i.e. Lovat Tweed with Olive Waterproof Canvas, or Charcoal Tweed with Black Waterproof Canvas. Charcoal with black is a boardroom mainstay. Look around any financial district in the winter and you will see men and women walking around in black and charcoal. It is a beautiful combination. What you won’t see is these same people walking around in a Nylon suit, or cheap waxed canvas from head to toe. They also won’t be toting around cheap Nylon bags to their meetings. So why do we settle as photographers? It’s a good question. A highly personal question, but a good one. Our goal is to make the camera bag glamorous and beautiful. We want to provide products to people that have an affinity for well made, quality products that last. But we understand that our products are in a niche market. There are lots of people that want less expensive bags and they don’t care what they’re made of, or where they’re made. And that’s fine. Every week we get asked the question, “are you developing any other camera bags?” The answer is, of course, yes! But we only develop bags we feel a strong affection for. Bags that are uncommon and don’t look or function the way every other camera bag does. 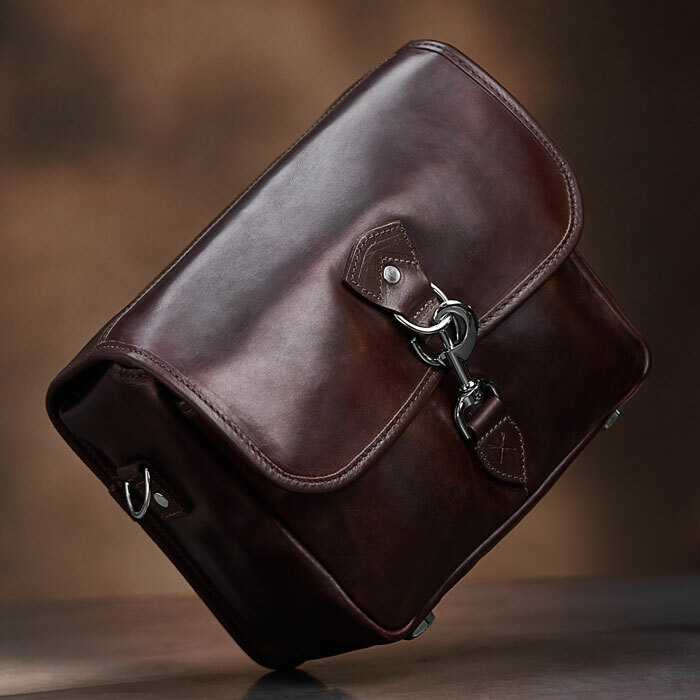 We have several designs in mind that we’re currently working on, which will yield beautiful, stylish camera bags. And we will update our blog in due course when we have more information to share. We value your feedback. If you have an idea for us, or there’s simply an aspect of a camera bag that you haven’t seen, or would like. Pop it into a comment down below and let us know. This entry was posted in Camera Bags, Design and tagged Camera Bags, fashion, style, Stylish. The collection of camera bags are really stunning and awesome. I m thinking to gift my friend as he is a photographer that’s why? but I m confused which one should I gift, as all are good looking. Thanks for sharing the beautiful collection.